Click on the names or pictures of the dog to be taken to their own page. Wlkabout Hot Property - "SOCKS"
The Australian Shepherd is not from Australia, it is an American original developed in the West by eastern and Midwestern sheepmen drawn to western adventure and the Gold Rush and by Spanish settlers in the Southwest. The Australian Shepherd is a medium-sized working dog with a relatively long coat. The breed is extremely agile, intelligent, loyal and hard-working. Though known as a herding dog, the Aussie has a talent for all types of athletic activities. However, the breed also makes an excellent companion dog for high-energy owners. Due to its high intelligence level, the Aussie is quite receptive to training and learns quite quickly. 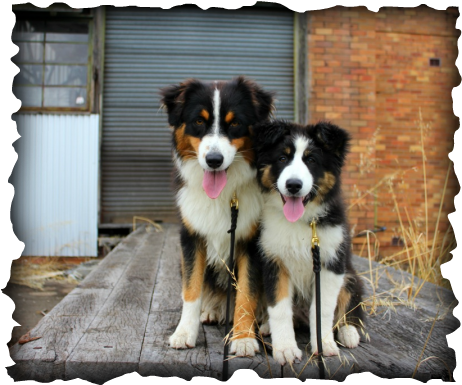 This breed's focus is work - with proper training, the Aussie is extremely obedient. The Aussie excels at dog sports and other activities like Frisbee, herding, agility and obedience competition. Frequent exercise is absolutely essential for the Aussie - even more than most dogs. The breed can become bored, frustrated and hyperactive if not active enough. Plus, exercise will help maintain the Aussie's overall health. The well-bred Aussie is a steady dog, good with children, intelligent, active, enthusiastic, and willing to work. He still has good herding and guarding instincts and will round up children or other pets if the occasion arises. He can be aloof with strangers but should never be shy or snippy. Potential owners should also be aware that this is an energetic dog, needing exercise and training to complement his work ethic. It is no surprise that he excels at agility, an enterprise that makes use of his athletic ability and his problem-solving ability. The Aussie is a medium to long-haired dog with a somewhat thick coat, so routine grooming is important. Thorough brushing of the hair should be done 1-2 times per week to avoid tangling and matting. Overall, the Aussie is a very smart and loyal companion that is affectionate and connected with its owner. The breed is very alert and in-tune with the sights and sounds around it. Most Aussies excel at herding and general farm/ranch work. However, they are also quite skilled in other jobs, including assistance, search and rescue, and pet therapy. Of course, the breed also makes a wonderful companion for the right family. The Australian Shepherd tends to adapts well to all kinds of households with proper exercise and training. Looking for more information about the breed?